This news, while stirring to the bold of ANY Grand Prix fan, is less likely than the new engine regulations to end the soul destroying reign of that unlivable Sebastian Vettel, but it can’t hurt . I can’t recall Ferrari management EVER recalling a decision, especially one as public and brutal as his sacking a few years ago. They literally paid him $20mm NOT to drive their car. 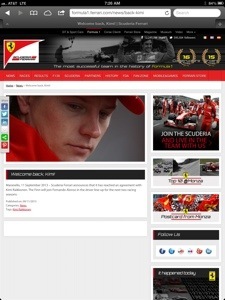 As much as I love Lotus, and this IS a massive loss for them, Kimi belongs at Ferrari. In the other hand, Nico Hulkenberg is rumored to be Kimi’s replacement, and he is, along with Paul DiResta the best of the new drivers. I had a quiet drive on Sunday. It was a half hour out and back. The temperature was in the low eighties, it was late afternoon and there was blissfully little traffic. It was the first moment I was completely absorbed by this Esprit. I should explain… …a car is a car, but in a car like this, there is a lot of other “stuff” happening while you are driving it that you don’t get in other cars. There are noises it takes getting used to, constant comments, and other reactions to the car from strangers, the disorientating way it cocoons you, the ride height, and the power to name some. It takes a while to sort of filter it out to the point that its just you and the machine. Well, that has happened, and it is as I remembered it. In a word: sublime. It’s funny how Lotus managed to combine the raw visceral violence of the 918 engine to such a polished chassis. 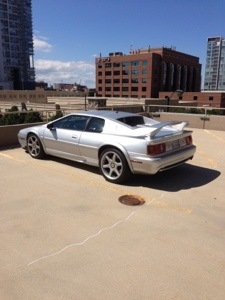 I know to this day Roger Becker still whines about the V-8 being an “engine too far” and on some level I agree with him, (after several years in an Exige) but taken without regard to any other motorcar, the Esprit is a fascinating experience. I don’t suppose any other manufacturer has ever managed to combine supple ride quality and communication as successfully. I have developed rhythm with the car, but I don’t suppose I will ever get “used” to it. The switchgear was familiar to me almost immediately, but it took some time to develop synchronicity with the machine. I am coming to know it very well. 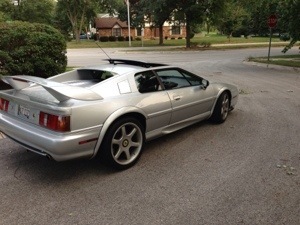 Ultimately, I don’t think I will have as complete an understanding of it as I have with my other Lotus cars. I am not tracking it, and only through driving a car at your limit do you ever really “get” it. Having said that, it’s devotion to business class travel, and the occasional spirited drive are really thrilling. I’m glad I have it in my stable. We have a VW SUV. It’s a great auto. 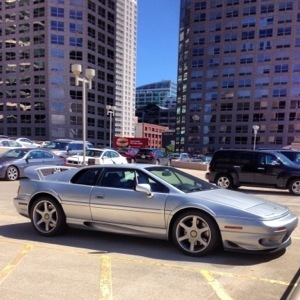 In many ways much more complete a vehicle than the Esprit. I am “used” to it, and what I mean by that Is it can be piloted without much thought. You get in, synch your phone, select the sat nav destination, your xm radio station, climate, and before you know it, you are at your destination. It’s almost like it was designed to make travel comfortably forgettable. With a sporting car, it isn’t the destination that matters, it’s the travel. After driving many more sports cars than I have a right to, and quite a few exotics, I can honestly say that only a few make the act of travel from point a to point b as entertaining and memorable as an Esprit. 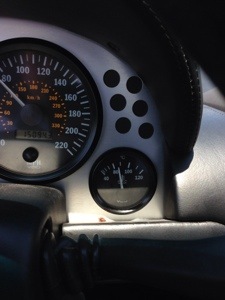 I think that was the point of the exercise for Colin Chapman. I am looking forward to the final service call of the year. It will feature tires, a radiator (bigger because I am paranoid, not because its necessary) a cat back exhaust, timing belts, and a couple of minor issues I have been living with. You never want to curse yourself by declaring a car like this “sorted” but at that point, I will be as close an a human can get with an Esprit. I plan on running it this fall until the roads are too cold to support the horsepower. There will be no “lack of use abuse” on my watch. I was in a rathskeller in Indianapolis a few years ago at a Lotus Owners Group ( http://www.lotuscarclub.org/ ) event hosted by the remarkable local club (Club House For Indianapolis Lotus Lovers, or CHILL for short… http://www.indylotuscars.com/home.html ) waiting for friends to show up and I noticed an older fellow sitting alone in the crowd. He looked familiar, so I walked up, stuck out my hand, and introduced myself. He smiled and confirmed my suspicion that he was, indeed, the legendary Lotus Racing mechanic Bob Dance. The story makes a couple of things obvious to me. First, if you aren’t active in a Lotus club at some point, you ought to be. I was a board member for a spell, and the people I met, and things I participated in will stay with me for the rest of my life. Second, how the predominantly “Elise” crowd could let a guy like Bob sit there unattended is way beyond me. 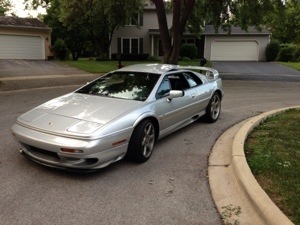 Sadly, at the moment, the biggest asset Lotus has is nostalgia, and car owners are the curators of that. It seems to me like there is a pre Elise and post Elise culture that really haven’t come together, and that’s sad. I’m sure I’ve blogged about it before but being a part of the community is a huge part of the ownership experience. There isn’t a company more open to its enthusiasts and that’s an offer sadly underutilized. Anyway, I believe that Bob will be back this year at LOG, and I hope there are people there as passionate as the history of the company as I am, or, at least as willing to pop for the pints. There was a betting pool in the office which made the arrival at my meeting small odds. It’s like these people know Esprits… But we proved them wrong. My seller appears to have vanished. It’s fine. I’m having fun at the moment. A funny thing happened this weekend. 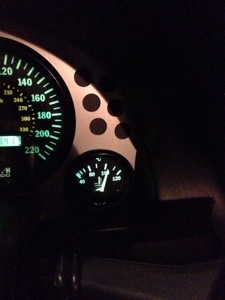 The Esprit ran perfectly. No codes. No temp. No flat battery. When they are working, they really are sublime. My friend T.J. has a buyer for it. Apparently some brave soul was looking at another car and demurred. My aggravation has turned to fatigue and its being considered. The decision to let it go is massive. Bizarrely, the one person most against selling it is Nancy. Ether this is brilliant reverse psychology, because I know in her eyes the car is completely unloved, or she remembers the incessant whinging from the last time I was Esprit-less. I need to wash it in order to take pictures. If nothing falls off it will be tough to let it go. I’ve given myself the afternoon to boil. Electricity-gate seems to be well sorted. I had the battery tested and it had a blown cell. It literally boiled out the side. Even though the nitwit at pep boys could see that, she still made me have it tested. It scored worse than I did in high school geometry (that was time I will never get back anyway…). Battery exchanged. Once replaced, I tested the volts for a few days and all is good with the charging system. Is never easy. on the test drive, I had a fault code. The dreaded P1460, which is the relay for the ac motor. 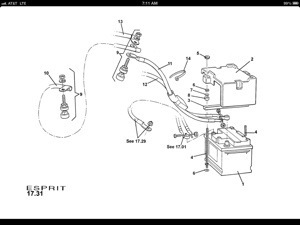 I replaced that, and I still had the MIL come on, so I went crying to T.J. Waszak who, acting partly as a tech, and partly as my Lotus shrink, walked me through the “dummies guide to the ac circuit”. It was a fuse. Score one for the power probe. Replaced. then I went on a short hop to check. Ac blasting. No code. Fantastic. Do short drives to check repairs count as summer driving miles? Anyway, T.J. Is a god among men for having the patience to work me through that one. If you have a chance to work with him, do it. He really is fantastic. Now, let me be clear as a glass of gin about this, I would NEVER let a v-8 overheat. Ever. I have seen how that movie ends. I was close to, CLOSE, to 110 and waiting for the fans to pull me back down. Since I JUST replaced coolant hoses, my suspicion is the crappy little plastic line from the top tank to the spare in the wheel well. I’ll proof that tonight. I’m not so concerned about the radiator since I intend to replace it anyway. My wife, and chief critic Nancy, asked me how it was going, and I told her it was great. When she was done raining on me for bullshitting her, and digested the facts, she told me that the cars name was “Christine”, after the car in the Stephen King book. I can tell that I am making progress with her because that’s actually more funny than vicious. 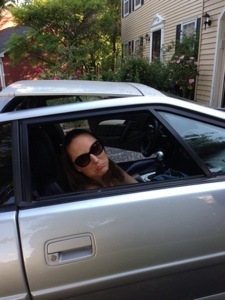 In another 30 or so years, she may actually agree to ride in it again. The funny thing is even though it has been kind of a problem child, I have driven it more to this point in the year than I would have driven the Exige. The web is a funny place for Lotus. Since its such a small manufacturer, the number of people that spent time developing a presence for them is negligible. 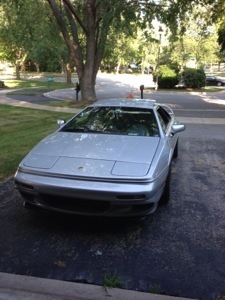 Since the Esprit has been out of production for some time, the majority of fan sites devoted to it are antiquated. It hasn’t been updated since 2009, however, it does a generally good job of describing the buying and owning process in the early part of the decade. It also has a cute “code of ethics” for exotic car owners which is fine if you are into that kind of thing. He spent some time on it back in the day, but it’s more of a time capsule at this point. That one has a story about a 112 day stretch in the pokey for speeding, a car with a name, and a heavy metal soundtrack. Not really updated in 7 years, though. There are also a number of sites documenting people taking a number of ruined cars and combining them into one running one. It would be mildly disturbing to realize that is where your car came from, but it’s really none of my business, and I sure as hell can’t cast stones at “problem child” Esprits, can I? The car clubs, SELOC, Lotus Limited, Lotus Corps, etc all have sites too, and they do a functionally good job of managing club affairs online. 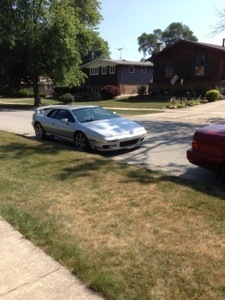 I think that kind of speaks to the type of guy that buys an Esprit or an Elise at this point. However, as a matter of course, there are a list of things that identify you as a tugger there too. If your car has a huge stereo, you are a tugger. If it has a name that is a made up word, you are a tugger. If your car has neon, or graphics, you are a tugger. Lamborghini style doors too. Huge rims, Supplemental body work, racing seats and harnesses, (unless you actually track the car), unnecessary gauge clusters, and snarky vanity plates all qualify too. Sadly the kind of person that believes they can actually improve on the work Lotus Cars does is also the kind who makes web sites about it. The people that work on them and drive them are just not that interested. So it’s kind of skewed. And then there’s me. I’ll leave it to you to decide where I fit.